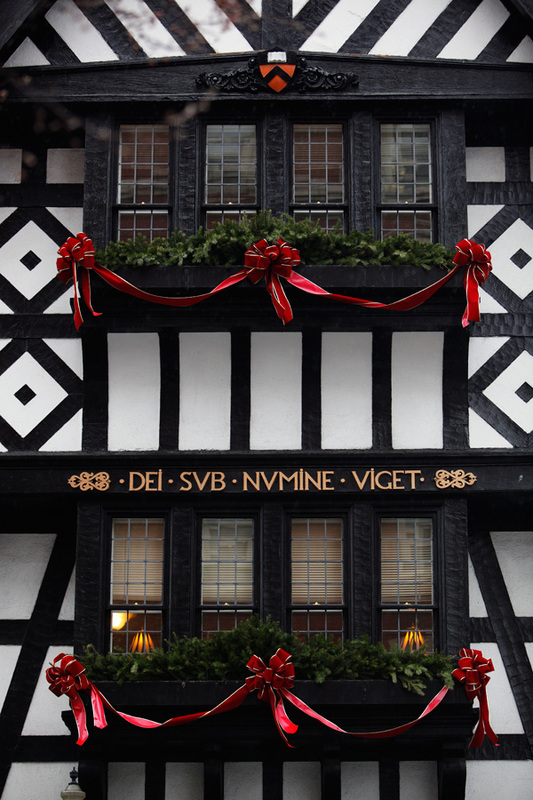 If there is in fact a jolly old elf with a white beard and a red suit, and if he does indeed unselfishly toil away up there at the North Pole, his legendary toy workshop certainly resembles this beautiful, half-timbered, Tudor-style ediface. Designed by Raleigh C. Gildersleeve on the model of sixteenth-century houses in Chester, England, and built in 1896, the Lower Pyne Building at the corner of Nassau and Witherspoon was a gift to Princeton University from Moses Taylor Pyne. The son of Percy Rivington Pyne and Albertina Shelton Taylor, Moses graduated from Princeton in 1877. He inherited a fortune and became one of the university's greatest benefactors. Pyne's resplendent estate, Drumthwacket, on Stockton Street in Princeton, became the official residence of New Jersey's governor in 1982. The Latin phrase DEI SVB NVMINE VIGET is Princeton University's official motto. It is usually translated as "Under God's power she flourishes." Of course, as in many translations, much of the subtlety is left behind. John Maguire, class of 1937, offers what he considers a fuller interpretation closer to the intended meaning: "LORD, our God, King of the universe, under the awesome, unsearchable riches of your eternal and limitless wisdom, knowledge, power, love, and sovereignty, it lives and grows strong." The standing joke translation among many Princetonians is, "God went to Princeton."